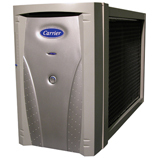 At Carrier, we make heating and cooling systems, air-quality products, controls and thermostats. But first and foremost, what we really make is your home comfortable. Allow us to clear the air. from the degree you want.